If you have been injured or a loved one killed while riding a bicycle, you may be entitled to compensation. In injury cases, such compensation could include, but may not be limited to: medical expenses, lost wages, property damage, and pain and suffering. In death cases, certain family members may be entitled to compensation for “loss of consortium” and the decedent’s estate is entitled to additional damages (click here for more information on wrongful death claims). The experienced personal injury attorneys at Kraft Davies, PLLC, understand the severity of injuries that result from cycling accidents, and can educate you about your options for recovery. Whether the crash was caused by a distracted driver or a defective bike part, it is important to consult with a knowledgeable lawyer to help you obtain the best result in your claim. If you are hit by a car or truck while riding a bike, you are likely entitled to be compensated for your injuries. Most often, these incidents are caused by car or truck drivers who do not see cyclists. 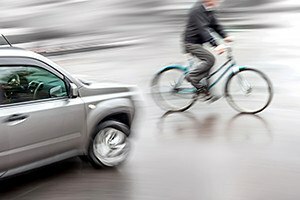 When changing lanes, entering the roadway from a parking lot, or turning right on a red light, drivers must watch out for bicyclists to avoid collisions. Recovery is usually obtained through the at-fault driver’s insurance company. Often times, insurance companies pressure injured parties to settle for less than full compensation. An inadequate settlements can prove devastating to an injured person who continues to accrue medical expenses beyond the settlement amount, or in wrongful death cases, to the family that relied upon the deceased for financial support. The lawyers at Kraft Davies, PLLC deal with insurance companies on a daily basis, and know how to do what it takes to make sure you are not taken advantage of. You may also find our related pages helpful on Your Rights After Being Injured in a Car Crash and What to Do If You Are Injured in a Car Crash. If you have a claim resulting from an accident caused by a defective bicycle, or defective bike part, it is important that you consult with a law firm that understands product liability claims, and has the experience to identify how the product failed. The law of product liability claims differs from other injury and death claims in a variety of ways. For example, the applicable standard of proof is usually different from other claims. In addition, the evidence required to bring a product liability claim is often highly technical. By consulting with industry experts and engineers, our firm can help you pin-point the reason for the failure of the product, and use that information to obtain the best result for our clients. For more information on product liability claims, click here. More than cars, trucks, or motorcycles, bicycles are susceptible to dangerous road conditions. Cyclists can lose control on wet surfaces, broken or uneven pavement, loose gravel, unsafe bridge decks, or construction sites. One of the most common places accidents occur is on bridges. For example, if a bridge is not designed properly, bike tires can become stuck in the grid-work or grates on the surface. Dangerous road condition cases are often extremely complex, and require testimony from engineers and other experts in the field. The evidence necessary to prove such claims usually differs from other injury cases. In addition, the level of care of the owner of the road may differ depending on the context (i.e. a retail parking lot owner generally owes a higher duty of care to patrons than a city owes to those using public streets). Our attorneys are experienced in the impact of these factors on claims, and are able to advise you of your rights accordingly. For more information on unsafe road design cases, click here.